This function allows you to draw a polar chart. All the drawing parameters are given trough a $Format array. To learn more about this please read the Format array guide. Polar charts were not existing in pChart 1.x. Best is to keep the scale computing to automatic (SEGMENT_HEIGHT_AUTO) to have the most eye candy rendering. 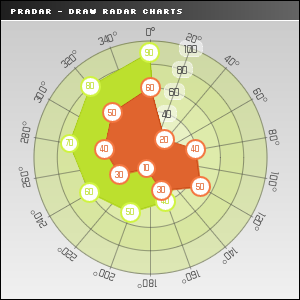 Polar charts share many parameters with the radar charts. The main difference is that the X axis is fixed to 0-360, data is given using the common way with the pData class, X values of the associated points are given through the abscissa serie which is then mandatory. Object is reference to a pImage object. Values is reference to a pData object. You can specify if the axis color with AxisR, AxisG, AxisB, AxisAlpha. You can fix the maximum value of the branches with FixedMax even if never reached. You can specify the axis rotation in degree using AxisRotation. You can draw ticks outside of the radard setting DrawTicks to TRUE. You can write the axis names setting DrawAxisValues to TRUE. You can write the axis names in a rounded box setting AxisBoxRounded to TRUE. You can choose the axis font settings with AxisFontName and AxisFontSize. You can write the points values setting WriteValues to TRUE. You can write the values in a bubble setting WriteValuesInBubble to TRUE. You can choose the values font settings with ValueFontName and ValueFontSize. You can specify an extra padding for the values with ValuePadding. You can tune the outter bubble visual parameters with OuterBubbleRadius,OuterBubbleR,OuterBubbleG,OuterBubbleB,OuterBubbleAlpha. You can tune the inner bubble visual parameters with InnerBubbleR,InnerBubbleG,InnerBubbleB,InnerBubbleAlpha. You can specify the position of the axis names with LabelPos (see below). You can specify the label paddings with LabelPadding (default is 4px). You can draw a background setting DrawBackground to TRUE. You can specify the background color with BackgroundR, BackgroundG, BackgroundB, BackgroundAlpha. You can specify a background gradient with BackgroundGradient see the details below . You can define the radar layout with Layout see the details below . You can write the segments values setting WriteLabels to TRUE. You can specify if the segment values should have background setting LabelsBackground to TRUE. You can specify the segments values background color with LabelsBGR, LabelsBGG, LabelsBGB, LabelsBGAlpha. You can specify if you want to draw a circle for each data point setting DrawPoints to TRUE. You can specify if you want to draw lines between each data point setting DrawLines to TRUE. You define if lines should loop to the 1st data point setting LineLoopStart to TRUE. You can specify if you want to draw polygons with your data points setting DrawPoly to TRUE. You can overide the polygons transparency with PolyAlpha. RADAR_LAYOUT_STAR, this will draw star like axis. RADAR_LAYOUT_CIRCLE, this will draw concentric circles axis. RADAR_LABELS_ROTATED, this will written with an angle depending of the axis position. RADAR_LABELS_HORIZONTAL, labels will be written horizontally. The starting color defined by StartR, StartG, StartB, StartAlpha. The ending color defined by EndR, EndG, EndB, EndAlpha.